Today, SPERI is publishing a Global Political Economy Brief summarising and analysing key aspects of the political economy of the so called ‘War on Drugs’. Prohibition, led by the US, has been the favoured policy to counter drugs since the 1960s, but in recent years a number of significant shifts have taken place and stimulated calls for reform. In April 2016, the United Nations General Assembly held a Special Session (UNGASS) on the ‘World Drug Problem’. UNGASS 2016 did not secure the radical reforms that many wished to see. Six months on from the special session, this SPERI Global Political Economy Brief assesses the consequences of UNGASS 2016: it explores why the special session was called; assesses what actually happened at UNGASS, both before and after; and analyses the implications for a creaking global drug regime. It concludes by reflecting on how the ‘world drug problem’ is as far from being ‘solved’ as ever, but argues that this may be no bad thing: there actually exist many different drug problems with many different potential solutions, and the gradual unravelling of prohibitionism is ultimately something to be celebrated, even if this undermines current forms of global narcotics governance. Download SPERI Global Political Economy Brief No. 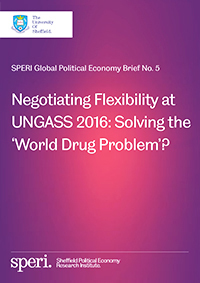 5: Negotiating Flexibility at UNGASS 2016: Solving the ‘World Drug Problem’?